Получена первая для меня e-QSL от пирата Bogusman из Англии в ответ на рапорт от 20 ноября 2016 года. Я уже и забыл про этот рапорт. Цитата из письма от станции: " Hello Dmitry. 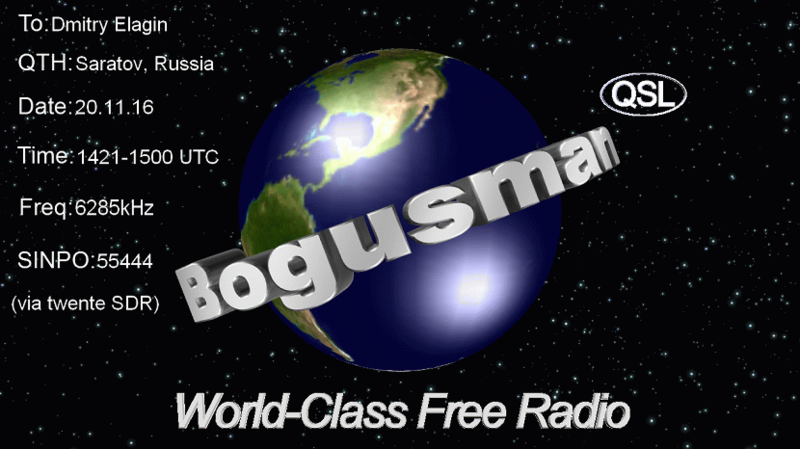 Here's a QSL from your Bogusman reception report in November last year. Sorry about the delay in replying; all reports are stored elsewhere for a long time, before I get them. 73s, QSL Helper." transmitter is used. Sites are various and are in England. The antenna is a half-wave dipole. and Sunday evenings, for earlier material from Bogusman and the Ghoul.